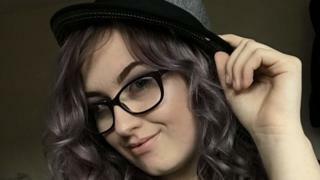 A man has been arrested in connection with the murder of a 17-year-old girl who was stabbed to death in a park in east London. Jodie Chesney was attacked while playing music in a park with friends in Harold Hill on Friday. Police said a 20-year-old man had been arrested in Leicester and taken into custody in the capital. Officers previously said two men walked up to the group and one knifed Jodie once in the back. She was pronounced dead just over an hour after police were called to the park at 21:25 GMT. Jodie was the fifth teenager to be stabbed to death in the capital so far this year. Former classmates described her as a "bundle of joy and such a good person" and said she was "so beautiful - inside and out". One said: "She was kind, wouldn't hurt anyone and would do anything to make anyone happy." Jodie's family issued appeals on social media for witnesses to come forward, as well as backing action to tackle knife crime. Relative Karen Chesney urged people to sign a petition calling for 25 years for using knives, and 10 years for carrying them. It has been signed more than 33,000 times, and will be considered for debate by MPs in Parliament if it passes 100,000 signatures. Home Secretary Sajid Javid has said he will meet police chiefs and other government departments to discuss efforts to reduce knife crime.